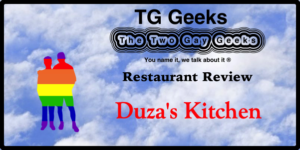 The Last time The Two Gay Geeks ate at Duza’s Kitchen it was with good friends Brendan and Gordon for dinner, a new offering at Duza’s. Since then we have been back for breakfast, which is what they are best known for and we were not disappointed. Duza’s Kitchen is tucked in the back of the building that also houses Tuck Shop (see what I did there) at 12th Street and Oak. They have been serving breakfast and brunch for almost three years. Chef Mensur Duzic is the mastermind behind Duza’s Kitchen and was previously lauded as bringing a certain higher quality to the kitchen of Phoenix Children’s Hospital. 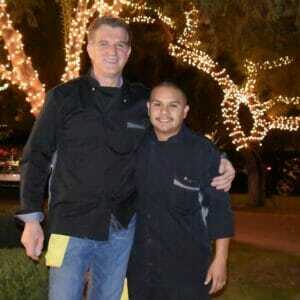 Chef Duzic is German trained in virtually every aspect of the culinary spectrum. At Duza’s Kitchen they offer a number of pastries that I assumed were brought in but discovered that Chef Duzic also creates those onsite as well. It is unusual for a chef that produces the caliber of food he does to be a pastry chef as well and those pastries are quite good to boot. 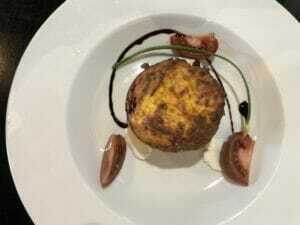 We decided one Saturday morning to visit Duza’s for breakfast since we had such a great experience at dinner previously. We were presented with the menus and of course, Ben focused on the Benedict. 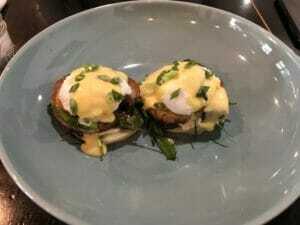 Not just any Benedict but, a Pork Belly Benedict or as the menu says Porchetta Egg Benedict. A nicely toasted English Muffin with herb mayo, pork belly, wilted kale (not too much), poached eggs, and Hollandaise Sauce. Not to toot my own horn but Ben measures every Hollandaise by mine (I use Lime juice instead of Lemon among other things) and he said this was pretty darn good Hollandaise (he does not say that often). The pork belly was nice and tasty and the herb mayo added just a bit of a different zing to push it over the top. Of course, I want to order everything on the menu just to taste it all but, as we arrived they were just bringing in the “hero” special they had just photographed for Facebook. It looked wonderful and I didn’t even know what it was. It turned out to be Chilaquiles. Well, don’t ask me twice about Chilaquiles, yes, I will have that and a side of the breakfast potatoes and one of the sausage quiches. 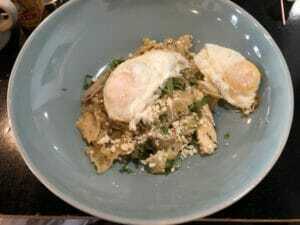 The Chilaquiles was made with poblano peppers and their chicken and jalapeno sausage. The corn tortillas were just right with the mixture of a mixture of the peppers and sausage and eggs to order on top. 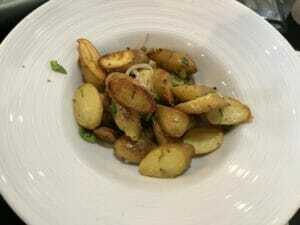 I had to have a side of the breakfast potatoes because it isn’t breakfast without potatoes (says the boy from Oklahoma…), and these were not just any potatoes, they were fingerling potatoes sliced and pan fried until they were just tender. I saw the sausage quiche in the pastry case and it looked lovely so I added that just to have a variety of items to taste. I expected they would toss it on a plate and bring it out. But no, they heated it up put it in a dish with heirloom tomatoes, crème freche and a bit of Balsamic vinegar. This was too much food but, I wanted to taste a few of the offerings. 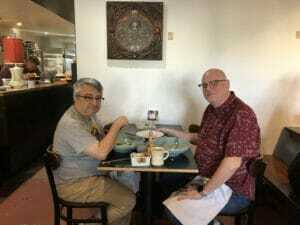 I went back for another round of breakfast with Gordon and once again, I had the special. Chef Duzic whips up some great specials every day ( I see them on Facebook and they make me want to go and have second breakfast). 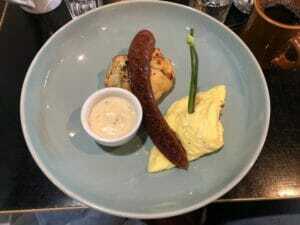 This time was no exception, he had made a puff pastry stuffed with his own sausage and served with a small cheese omelet and another sausage link. It was accompanied by a sausage gravy that pushed it right over into the stratosphere. To say that I love this place and the food they serve is an understatement. If you want to try a nice cozy and friendly breakfast place, stop by Duza’s Kitchen, you will not be disappointed. Now, I have to visit at sometime other than breakfast to see what wonderful concoctions he prepares for lunch.